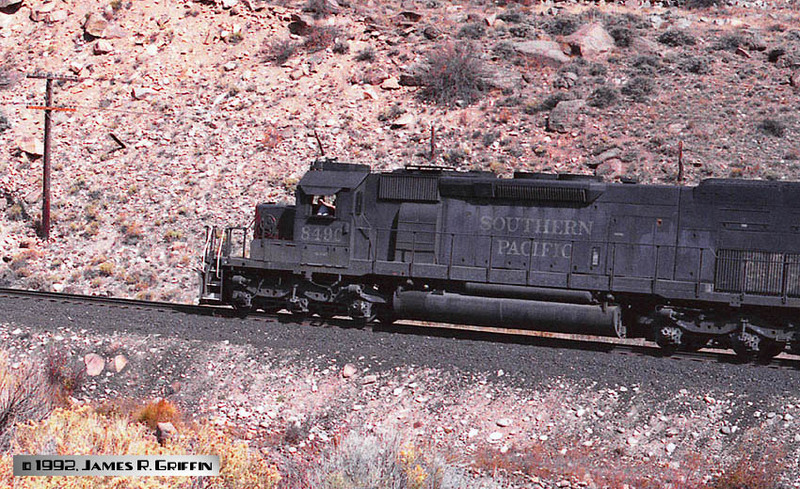 Southern Pacific always had a need for lots of big six-axle power. The system’s characteristics (many mountainous grades and tunnels) led to some unique innovations, most notably the development of the “tunnel motor” modification. This was applied to SD45T-2 and SD40T-2 models from EMD. 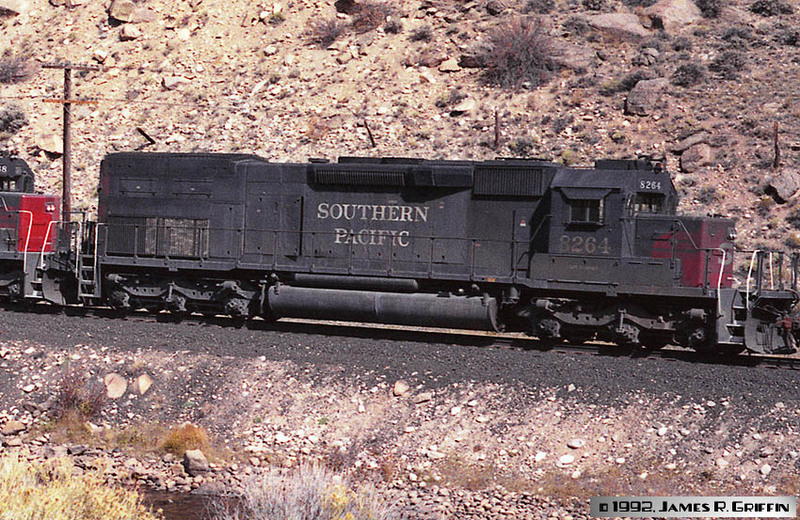 By the time of the merger with Union Pacific, enough locomotives had been rebuilt that it was not always easy to tell what was under the hood. 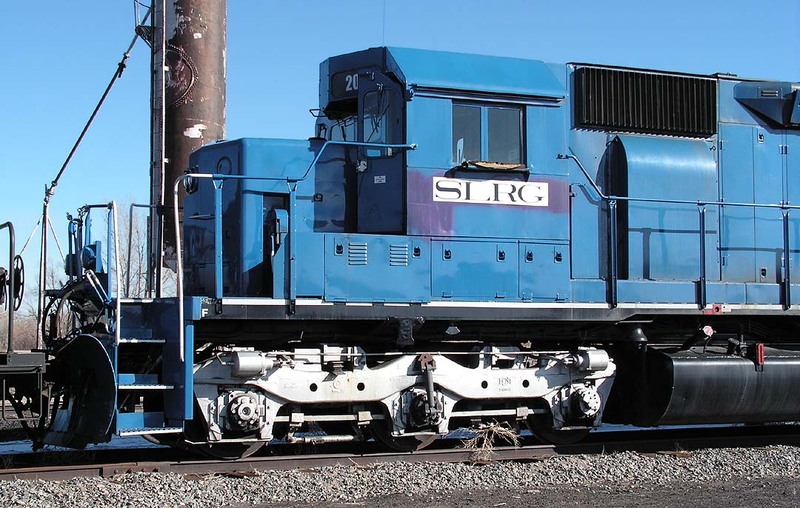 For instance, many rebuilt SD40-2’s were riding around on what had originally been SD45 frames. 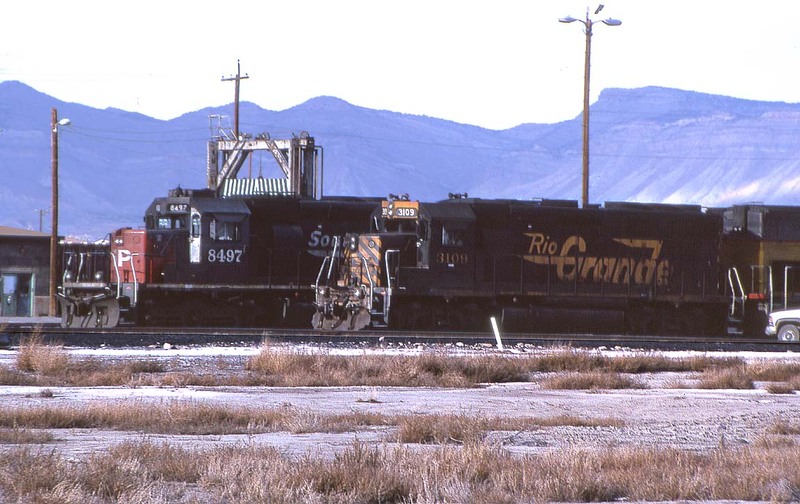 Even some Rio Grande SD45’s were reincarnated in this way as SP units. It helps to have a well-researched resource at hand, when spotting the SPL. By the period that I cover, all remaining 6-axle locomotives were EMD products, with the exception of the late-arriving C44-9Ws and AC4400s (and one lonely U33C) from GE. On all units purchased after the merger, the headlight arrangement was simplified considerably from the usual SP practice. The red Mars lights and other signal lights were abandoned (and removed from older units). None of the newer units even had lights on the low nose, until the AC4400’s arrived. Instead, amber beacons were installed over the cab. Later, when ditch lights became the norm, the beacons were left off, and sometimes removed from existing units. But first! Here’s a shot of two C44-9Ws, a through-the-windshield photo, which is the best I could manage while driving on I-70. It’s June 1995 at New Castle, Colorado. Nos. 8137 and 8146. 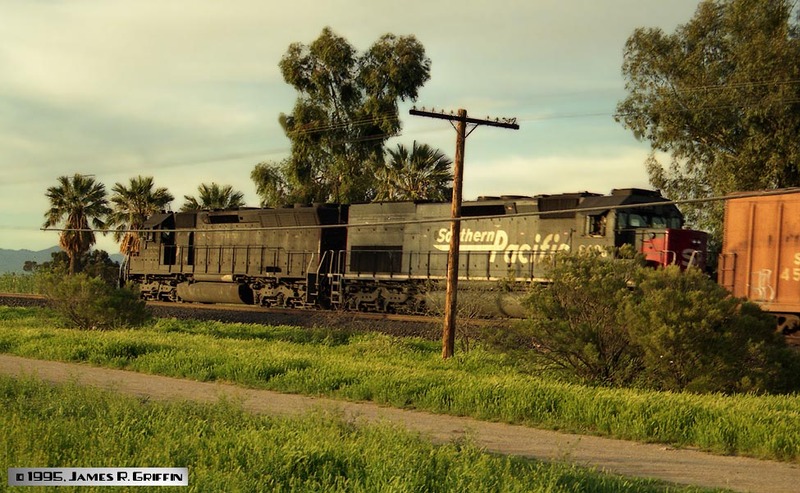 Here are four photos of ex-SP 7343, an SD40R. 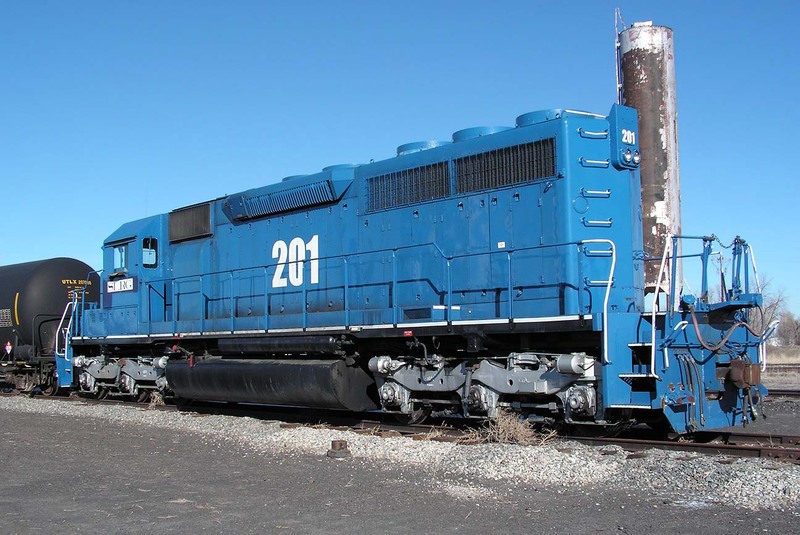 This unit was retired by Union Pacific, picked up by Balfour Beatty, who painted it in this blue shade. In 2009 it went to the San Luis & Rio Grande, where I photographed it on 12/28/2009. The following year it was sold to ISLX. 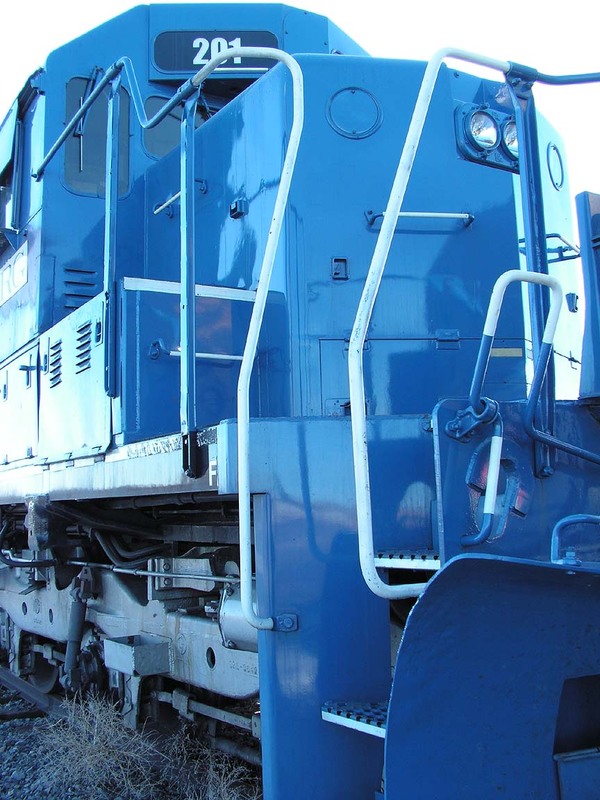 Despite the blue paint, the locomotive is essentially set up the same as during late SP service, including headlight installations and platings. I have left these images at a fairly large size, so you can better make out details. The left-side sunshade has gone missing, but otherwise I see no noticeable changes. SD40R in Helm Leasing (HLCX) lettering, on the former Golden State Route near Tularosa on 2/18/2008. This unit received a new number when it left UP’s roster– it’s now No. 6335. 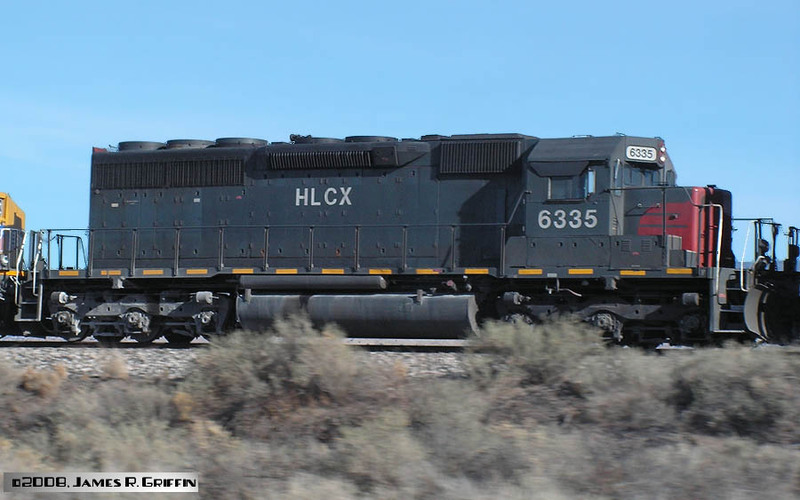 HLCX 6335 is ex-GECX 7313, exx-SP 7313, originally SP SD40 8400. The headlights were also moved up from the low nose to above the cab. 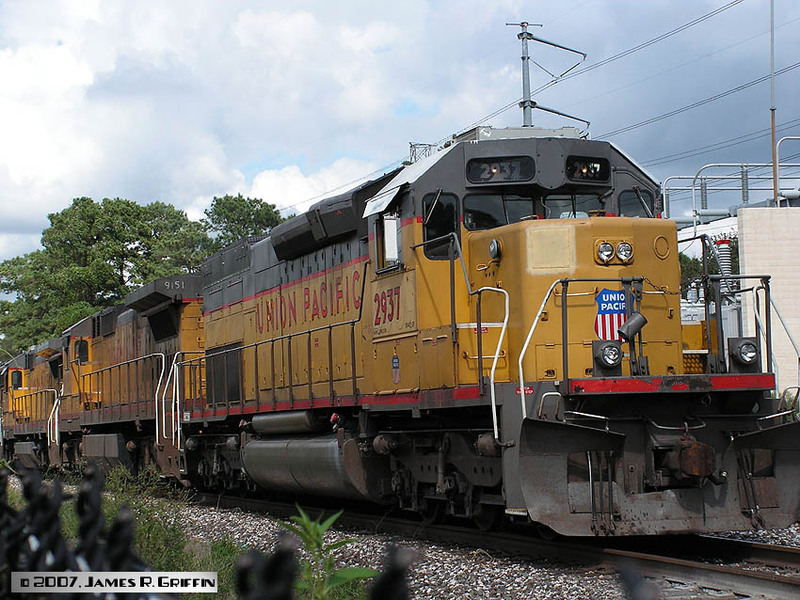 Still very cool to see an old EMD running on a mainlilne autorack train in 2008. 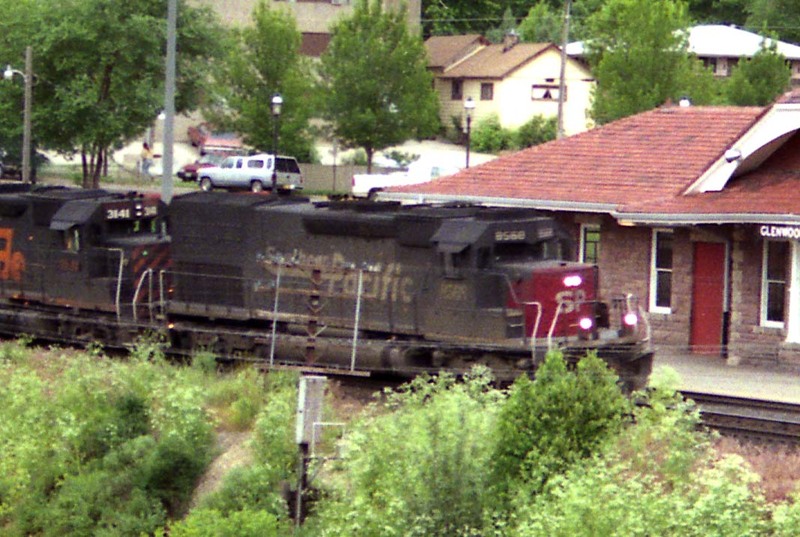 SD40R No. 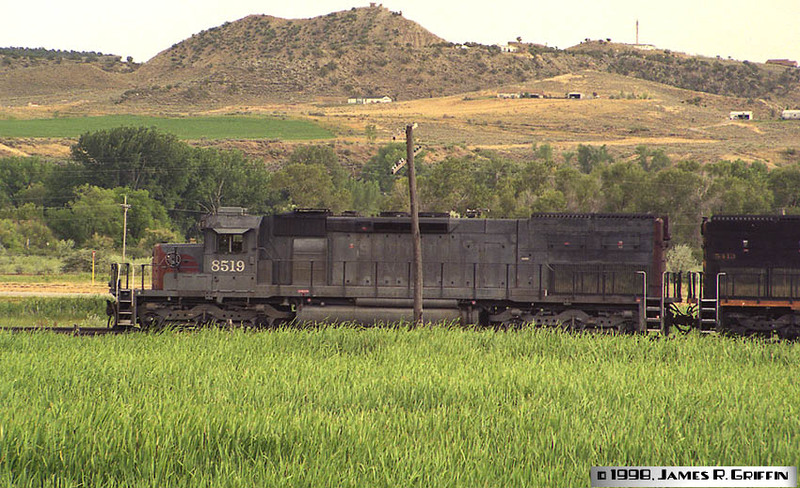 7349 leads the ZDVRO intermodal train just east of Parachute, CO on 8/11/1999. It’s paired with Rio Grande tunnel motor 5404 as the sole power on this UP train. The train was flying past at 70 mph, photographed from the shoulder of Interstate 70, so my photos weren’t stellar, but what the heck… Here’s a side view. SD40R No. 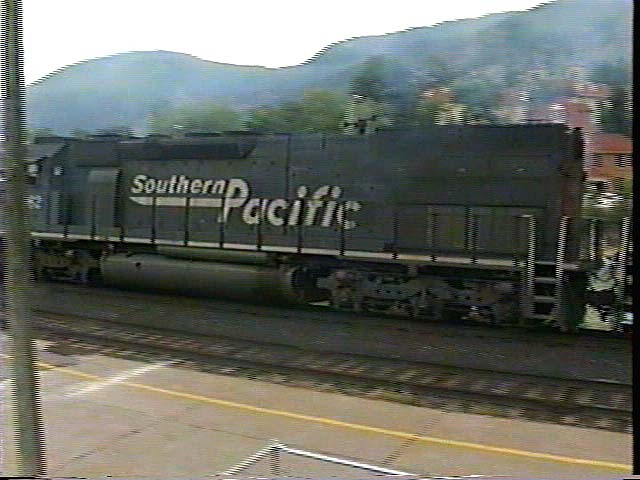 7354 is part of a four-unit swing helper at Glenwood Springs, 6/29/1995. Image from a video capture. Typical for the time, it’s extremely grubby, the long-hood lettering is nearly invisible, and it has ditch lights. 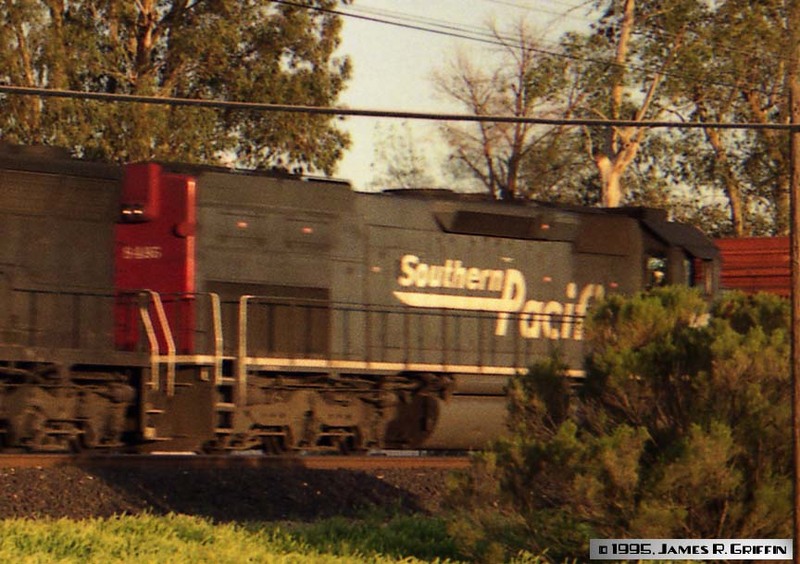 SP SD40R No. 7368 is the middle unit on a westbound intermodal train at Granite, CO on 10/22/92. 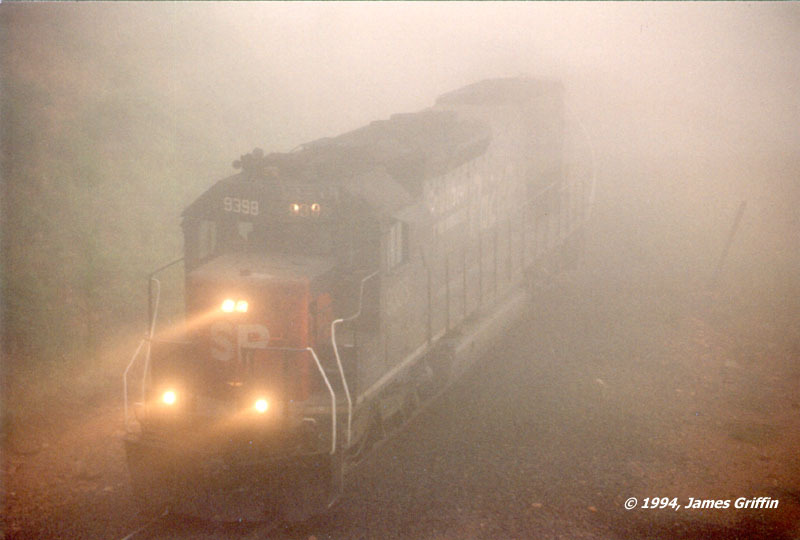 SP SD45R No. 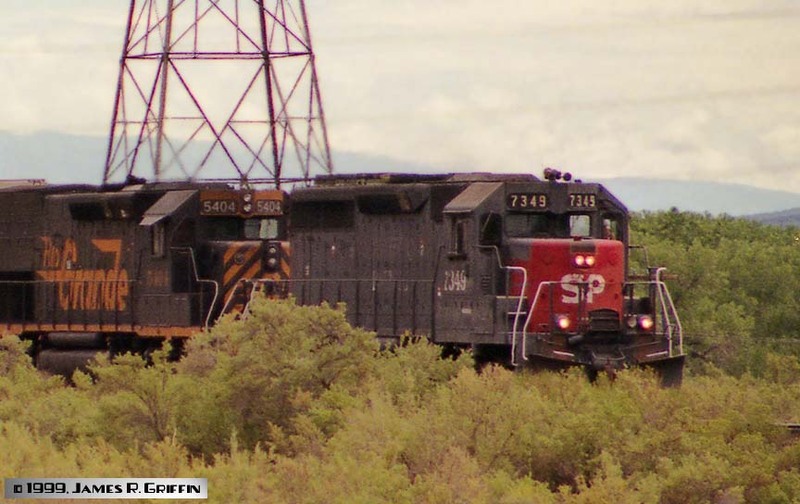 7454 heads up ten units and a long manifest train, between New Castle and Glenwood Springs, CO (7/1/1995). She’s showing her age and the wear-and-tear of heavy use with inadequate maintenance. SD45R No. 7552 leads a drag freight westbound out of Tucson on 3/13/1995. SD45R No. 7562 is still in Kodachrome paint from the Merger That Never Happened. 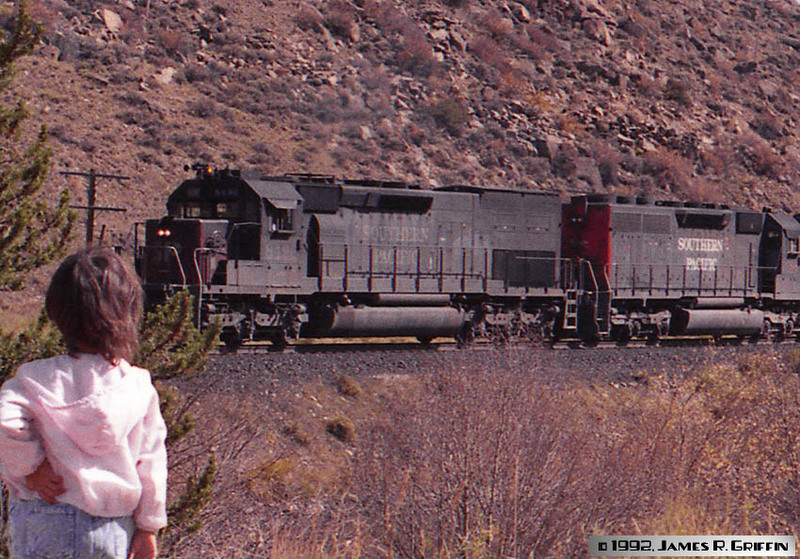 It’s 11/25/1994 and she’s running second on a coal train about to enter the Moffat Tunnel. 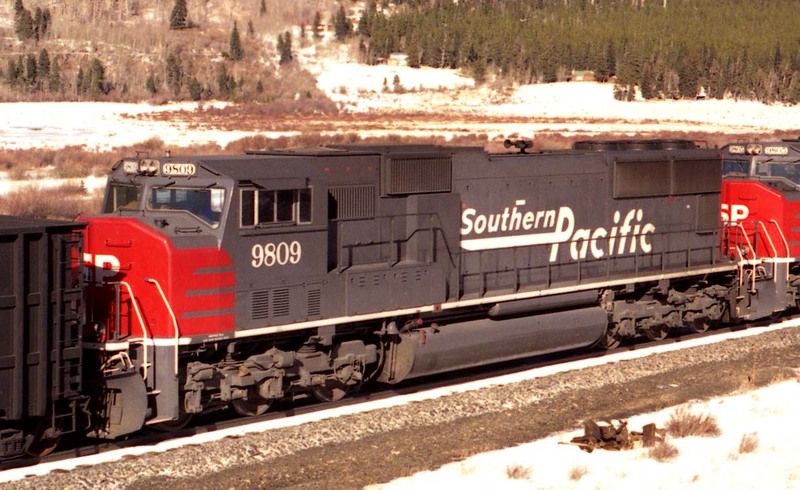 SP 8605 is actually a SD40M-2 rebuild from Morrison-Knudsen, delivered in 1994. She only looks like an SD45. SD40M-2 No. 8694, another MK rebuild from August 1994, is one of the stranger-looking locomotives I’ve seen (check out the location of the radiator fans, and the length of the long hood). 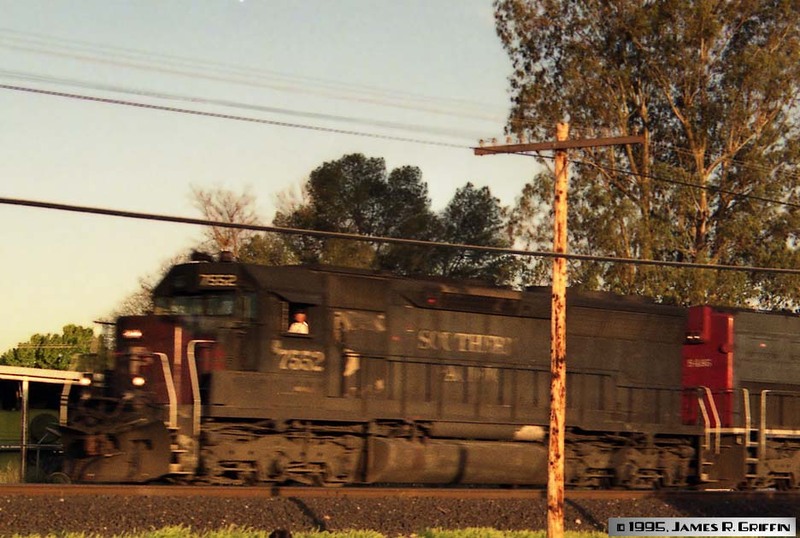 It is one of six former SDP45 (or SD45R, if you prefer) units originally built for the Erie Lackawanna. 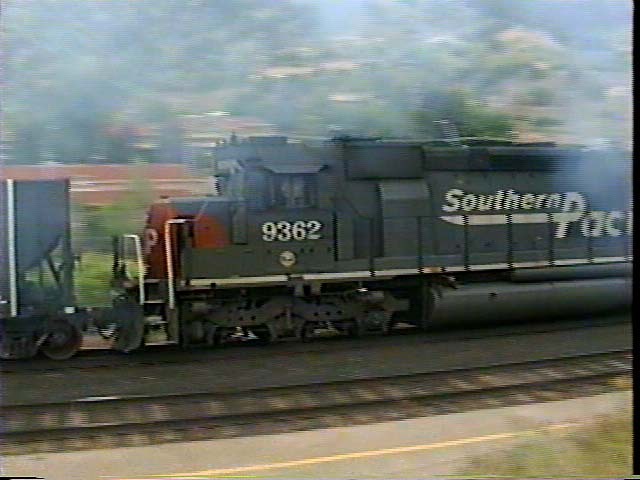 It’s at Silt, CO on 8/04/1998. See here for more information. 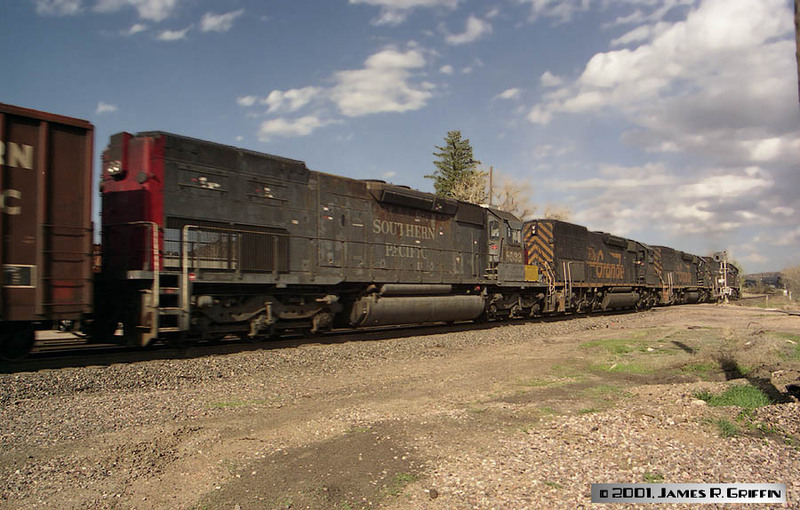 Something old: a pair of SD9’s are running dead-in-consist on an eastbound freight at Clifton, CO on 6/25/1995. One can speculate that they were being moved into retirement. The Kodachrome unit, No. 4345, is pretty easy on the eyes! Image from a video capture. SD40T-2 No. 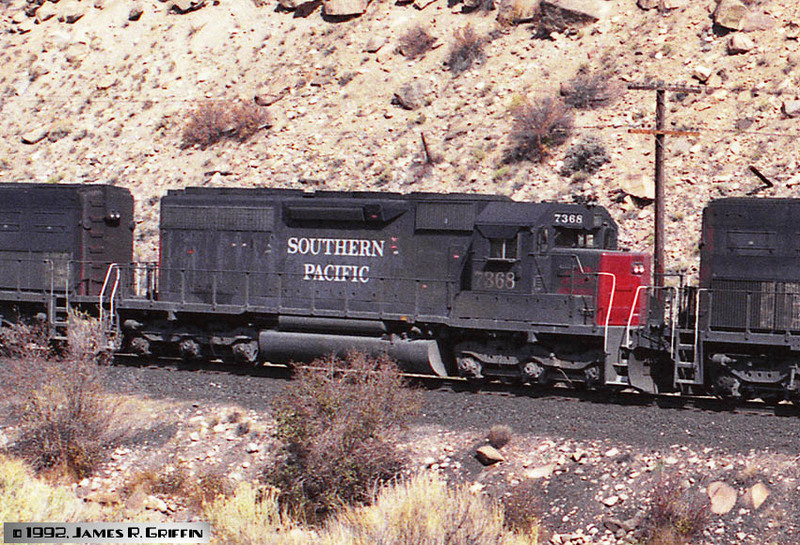 8236 is running elephant-style behind three GP60’s on the Golden State route on June 25, 1997. 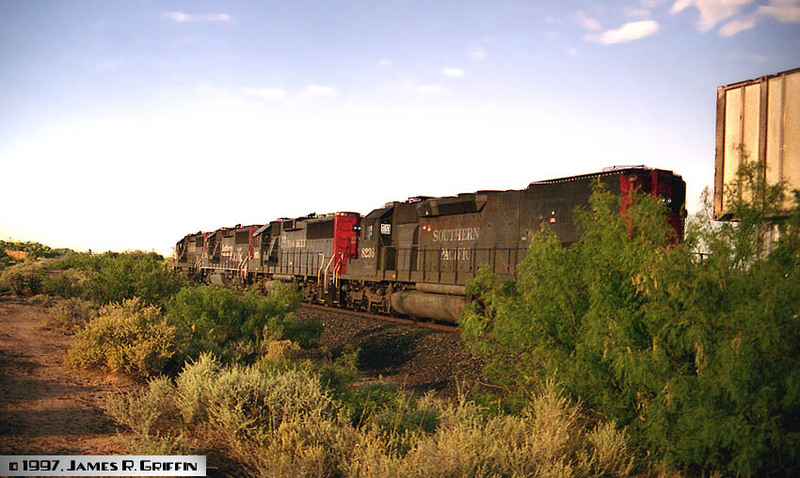 The westbound train is just entering Alamogordo, NM, and it’s 9 months after the UP merger. SP No. 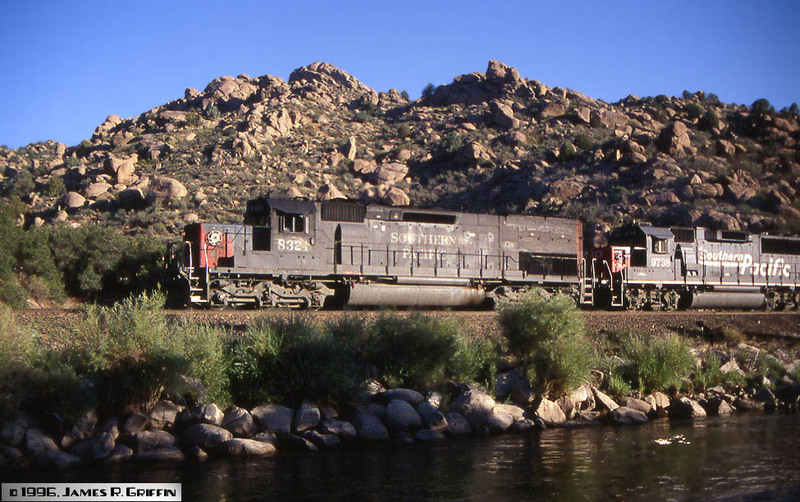 8248 is in the middle of the consist of an eastbound train leaving Tucson on Feb. 5th, 1988. It was part of an order that arrived in 1980, as are the units above and below. Update: this unit was a full UP repaint, and I caught it in Houston on 10/17/2007 as UP No. 2397 (almost exactly 15 years after this photo). Snoot No. 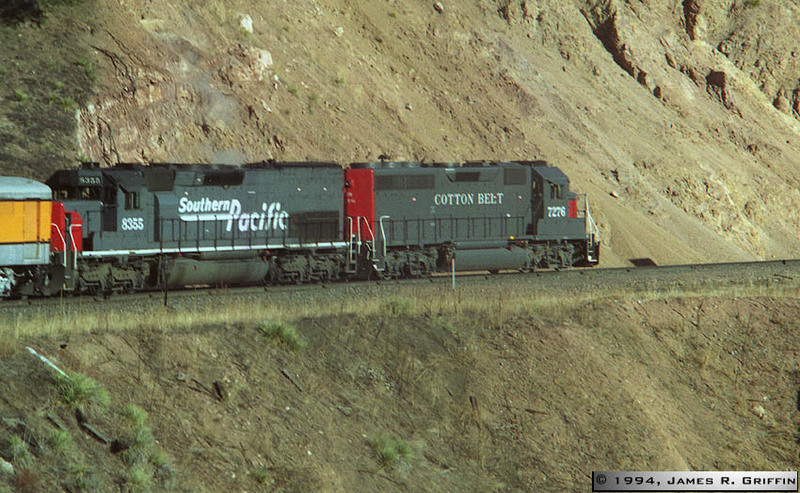 8321 is westbound at Cotopaxi, CO on 8/17/96, three weeks before the UP merger. SD40T-2 No. 8491 is running fourth on a westbound manifest at Johnson Village, CO On 2/18/1994. It’s been repainted into Speed Lettering and had the usual modifications. Also note the nose of SD45R No. 7557, a Kodachrome unit. You can see where the signal light and upper headlights were removed, and a beacon added. No ditch lights at this time for her, though. SD40T-2 No. 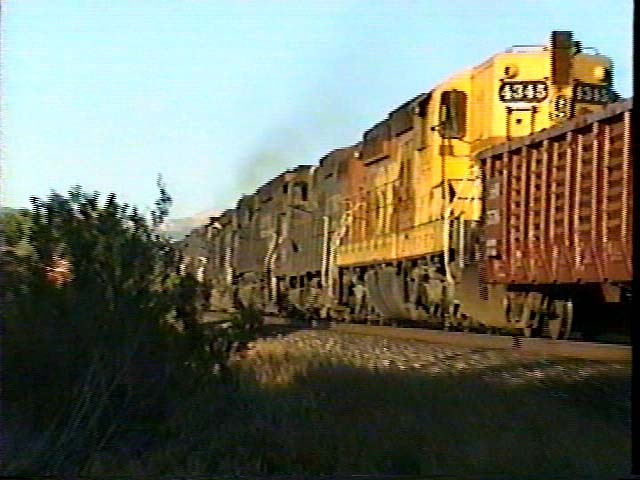 8495 is the trailing unit on a westbound drag freight at north Tucson, March 13, 1995. She’s been repainted and modified in the usual ways. The bell is still over the cab, though– See this photo. 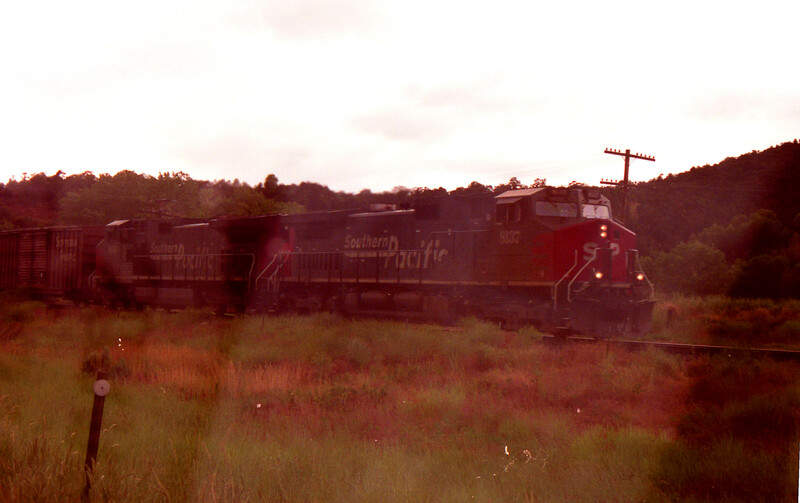 Two views of SD40T-2 No. 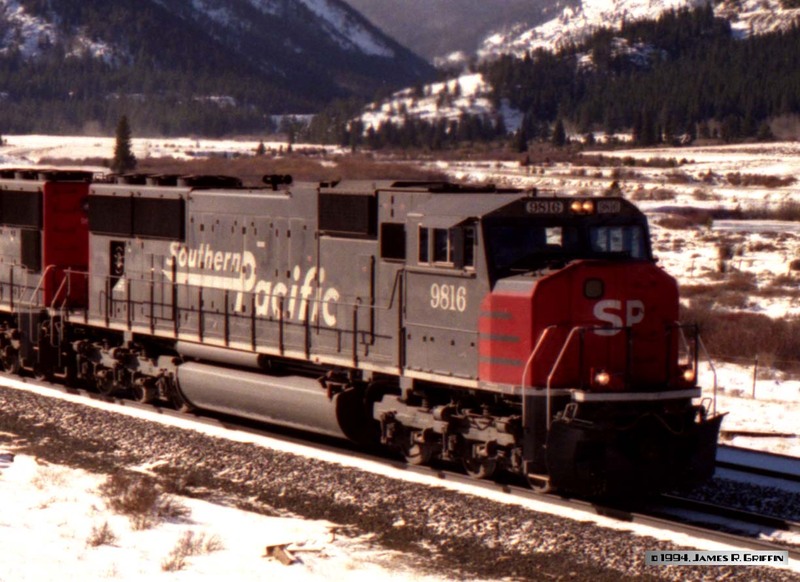 8496, here leading a westbound intermodal train at Granite, CO, on the Central Corridor route. These are cropped from larger images. SD40T-2 No. 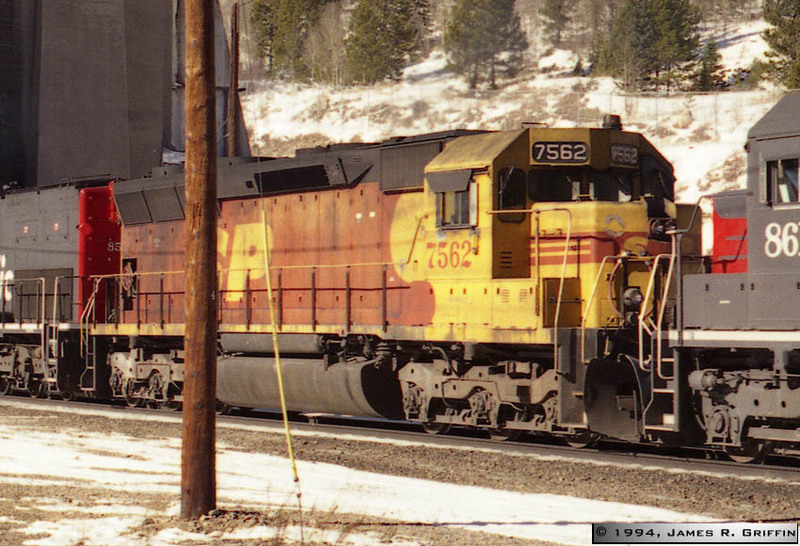 8497 sits on the readyline at Grand Junction on March 7, 2002. It has the usual Speed Lettering modifications, including SP-style ditch lights and relocation of the horn. The low nose plainly shows the original SP light bracket. 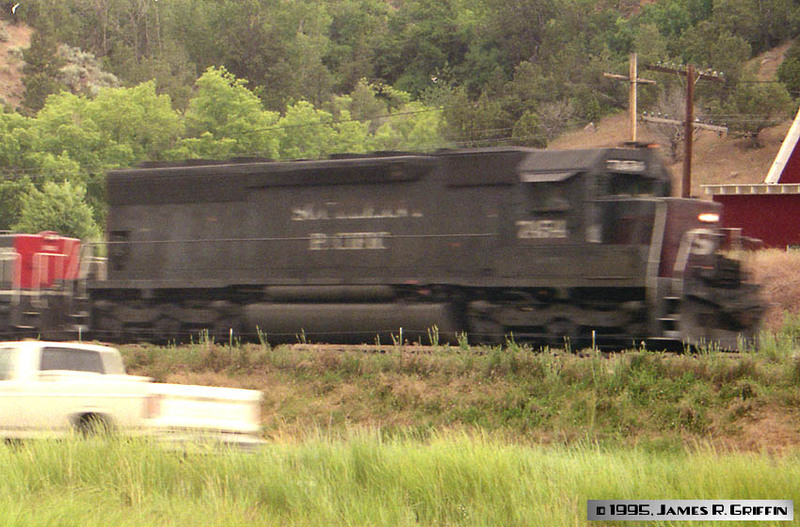 Here’s an extract from a larger image of SD40T-2 No. 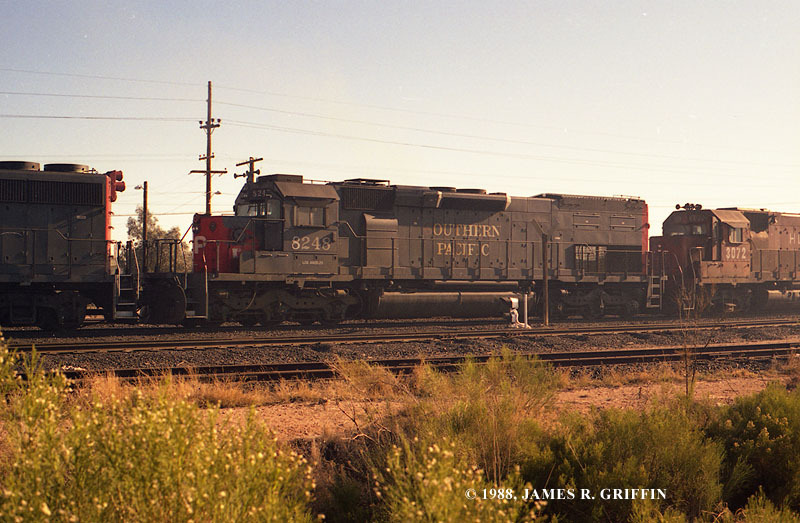 8506, entering Tucson on 2/05/1988. Sorry about the power pole. Note that she still sports the full light package. It was still about eight months until the RGI merger would be finalized. SD40T-2 No. 8532 is running fourth on the MDVPU manifest on April 26, 2001. It’s rolling through Sedalia, CO, at about 5:00 PM. It’s in the company of three D&RGW tunnel motors; all four units are having miles worked off so they can be retired sooner by UP. Nevertheless, it was great to see four tunnel motors together in 2001. SD40T-2 No. 8560 heads up a westbound empty coal train at the east portal of Moffat Tunnel on 11/25/1994. It’s freshly shopped and repainted (sparkling clean). In a somewhat-unusual move, the hole where the nose beacon was removed has been plated over. In this detail from a larger frame, dusty SD40T-2 No. 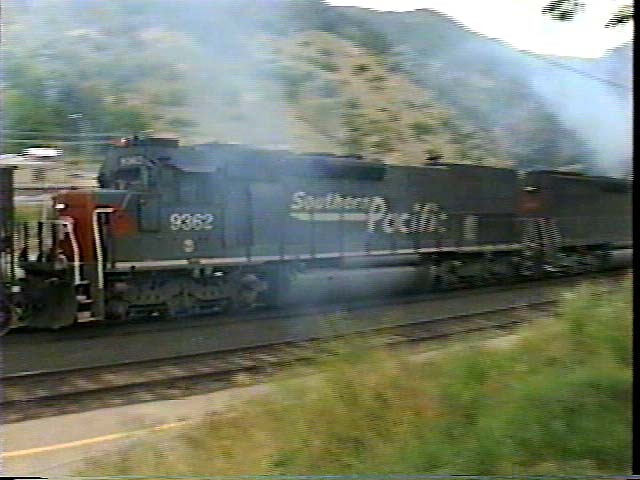 8568 leads a westbound train of auto racks through Glenwood Springs on the afternoon of June 29, 1995. SSW SD45T-2 No. 9164 comes into Tucson from the east on 2/05/1988. The two quickest ways to differentiate between a 40 and a 45 are: (1) the 45’s nose is pushed out onto the front porch, and (2) those little panels above the open grille on the rear. The 45 has three; the 40 has two. 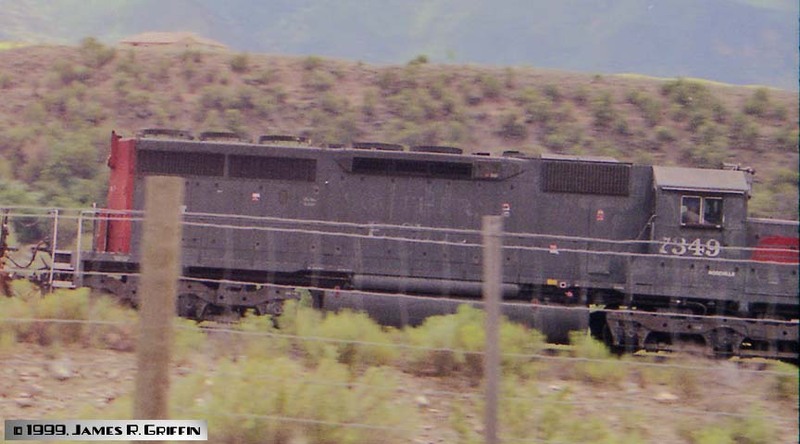 Four photos of SD45T-2 No. 9362. 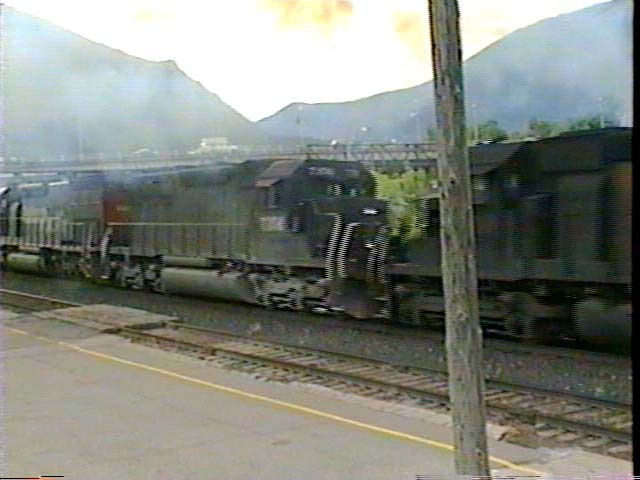 Here, it is the last unit on a four-place swing helper, shoving an eastbound coal train out of Glenwood Springs on 6/29/1995. It has been repainted in Speed Lettering, so technically this SSW unit is now SP. The next unit ahead is an SP SD40R, then D&RGW tunnel motor No. 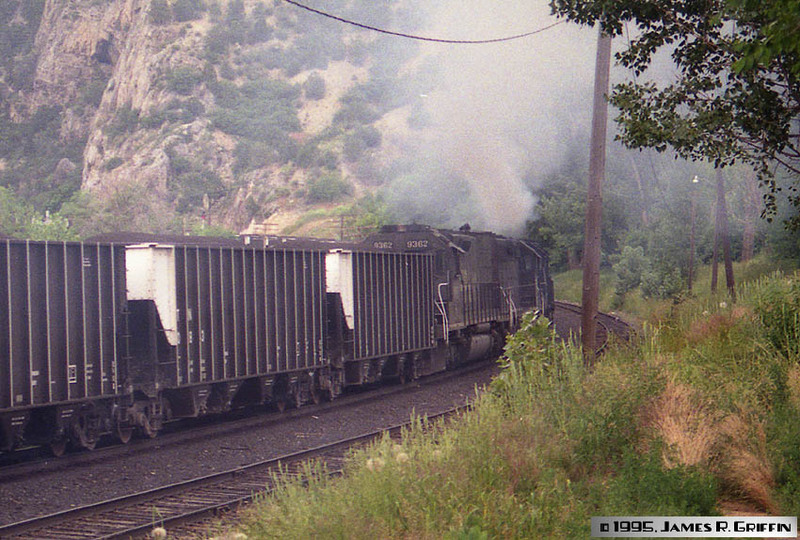 5366 (making all the smoke), then Rio Grande SD50 No. 5515. It looks great on video, believe me! The top three images are screen captures from video, hence the lower resolution (bottom shot is 35 mm film). Cotton Belt SD45T-2 No. 9372 is on the point of Amtrak No. 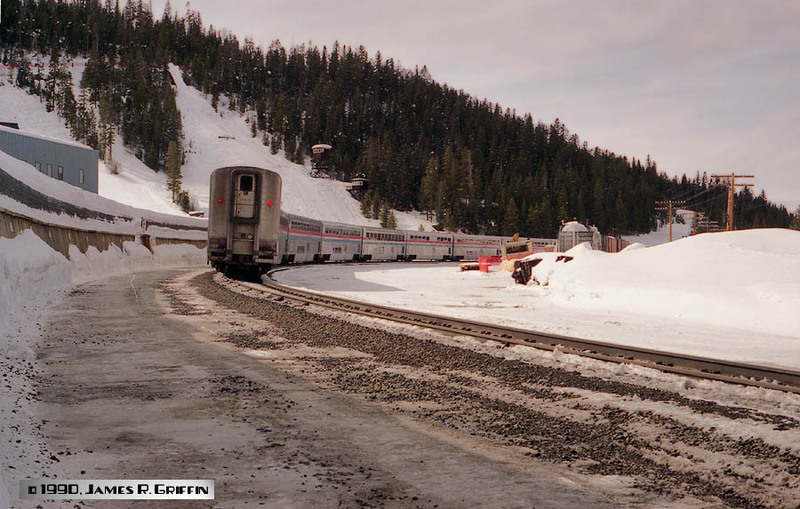 5, the California Zephyr, on March 14, 1993. The train is several hours late, which may be why this six-axle brute is leading it up the hill. Mechanical problem? Power shortage? One of my all-time favorite photos is of SD45T-2 No. 9398, running light in the fog at tunnel 1 on the Moffat line. It’s also a full repaint in Speed Lettering. The date is 7/20/1994. 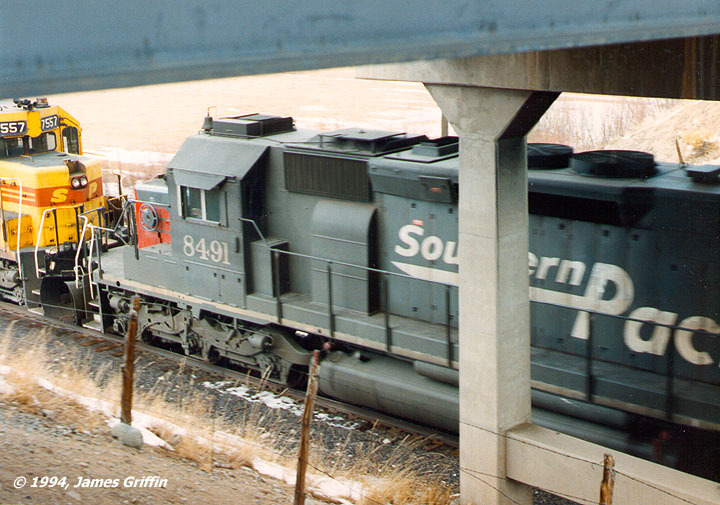 This image, a detail from a larger frame, shows a pair of SD45T-2’s in Fraser, CO. No. 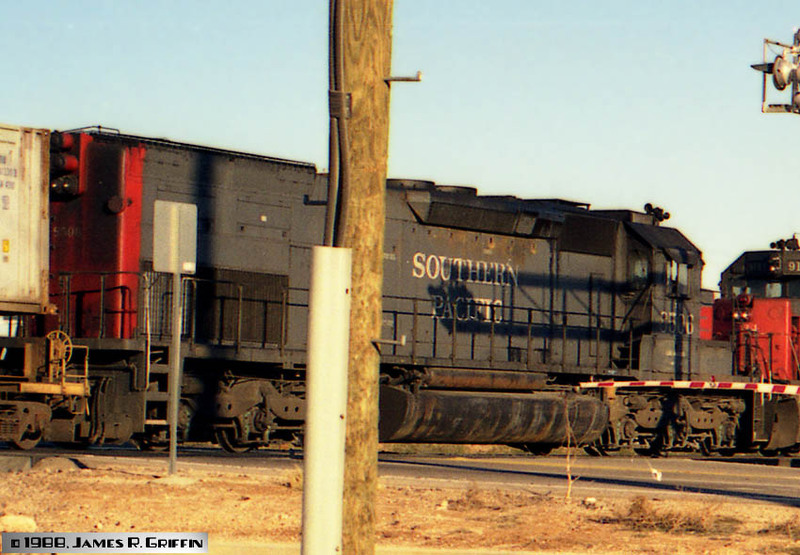 9401 is a Cotton Belt unit that’s been redone in Speed Lettering (including having the horns moved and ditch lights added). 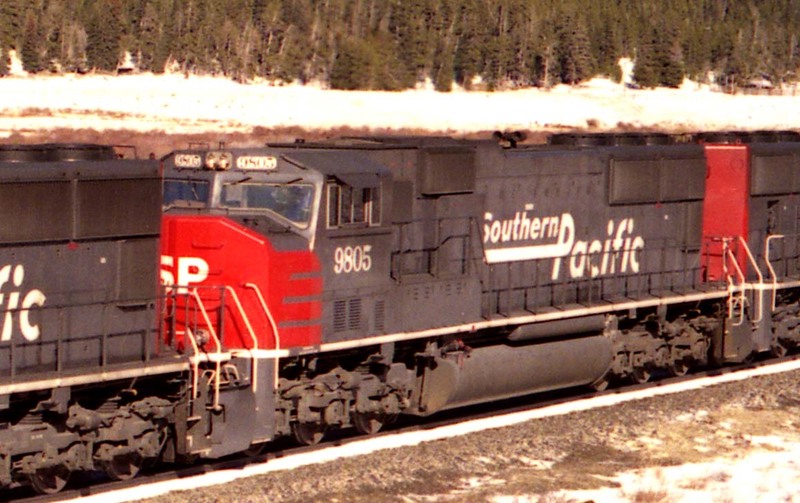 The other unit is SP SD45T-2R No. 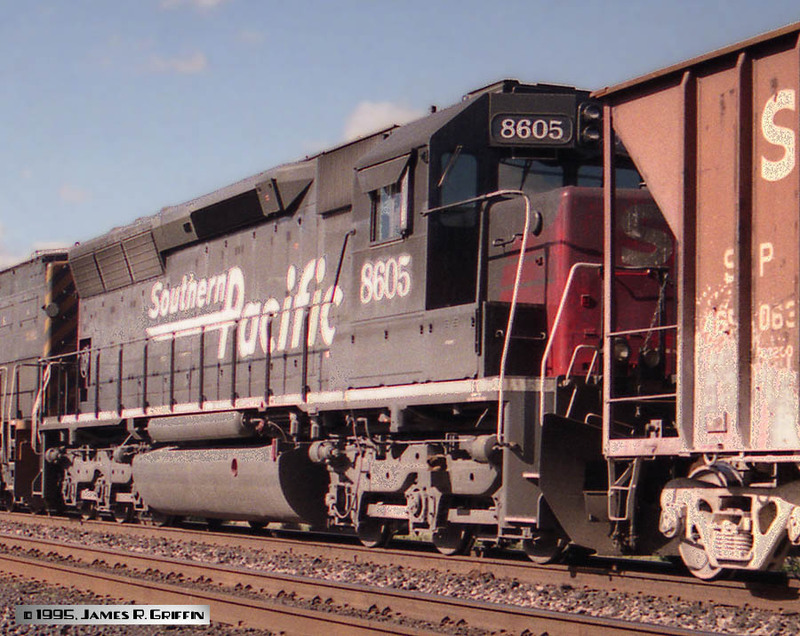 6850, one of a group rebuilt from the as-delivered SD45T-2’s circa 1988. 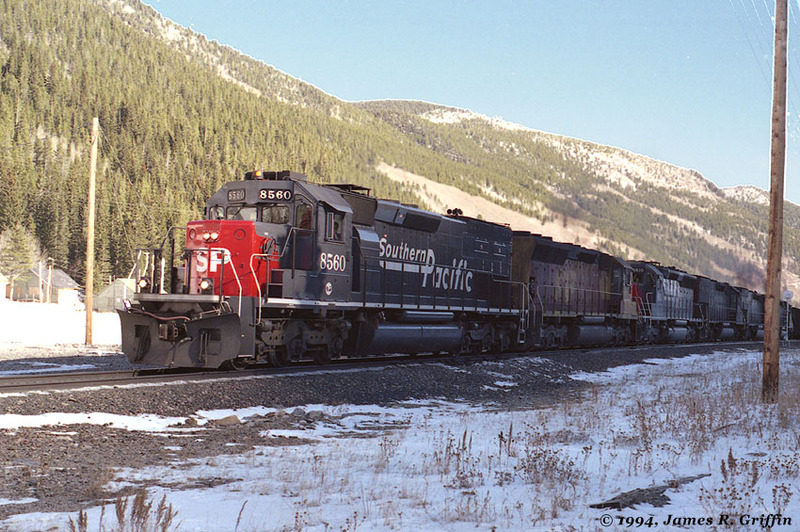 SPL purchased a total of 25 SD70M’s between June and August 1994. These were numbered 9800-9824. Per the SP website, they were used primarily on the “I-5 Corridor” between LA and Portland. However, they occasionally wandered elsewhere on the system for testing. 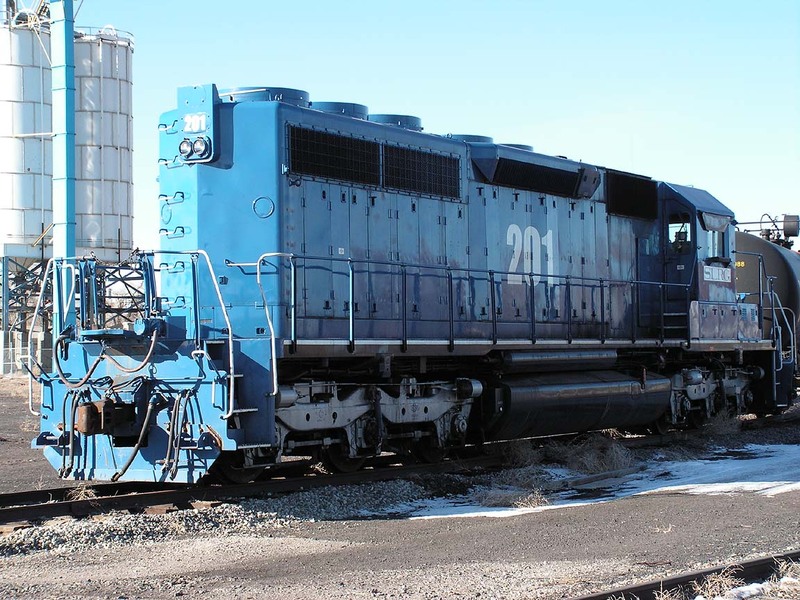 Acquired just two years before the UP merger, they were the last order of road power that SP made from EMD. No. 9805. Today it’s the middle of three units in the consist. No. 9809, running third. They are remarkably clean, considering the weather, which makes me believe they had only just arrived in the Tunnel District. No. 9816 was the leader. At this point in time, ditch lights were still something of an innovation; most locomotives did not have them yet. New ones did, of course, and these guys were quite new. Built July 1994, hence only 4 months old in this image.